This is a post about the EarthBox from Fresh Dirt, a Sunset Magazine blog. A mystery was solved yesterday thanks to Johanna Silver of Sunset who commented on this post. This prior post about the EarthBox was in the back of my mind (but forgetting that I had posted it) when I did a search on the Sunset website. I was curious when it didn’t show up and thought that it might have been removed. That was not the case. It didn’t show up on my site search because the blog has a different URL than the main site. I need to be more careful when doing site searches on websites and not overlook any linked blogs with different URLs. The Fresh Dirt blog is now in my RSS reader and I look forward to more good news from Sunset to share with you. In any case, it was good to know that Sunset has both an EarthBox and Tomato Success Kit in their test garden. Incidentally, a test garden is a public service that we do not have here in the Big Apple, which is not so big on modern horticultural methods. We very much need a test garden here in the NY Metro area of 19 million people that demonstrates various methods of sub-irrigating edible plants whether in boxes, buckets or raised bed planters. Urbanites should know about all the options to gardening in city dirt, which is often contaminated. With multiple botanic gardens, it is a sad commentary that we do not have a demonstration garden. You might recall last summer when I blogged about my change-of-heart regarding the EarthBox. I'd been skeptical for a long time and was so pleasantly surprised by how well this self-watering container did in the test garden. Kit Takla - Source of Tomato Success KIt Revealed? This is the sub-irrigated planter (SIP) shown in the TPIE video. It’s called Kit Tapla made by Marchioro, an Italian company. What is most interesting is that it reveals that the Tomato Success Kit from Gardener’s Supply is evidently Italian and not American. It remains to be seen whether this SIP continues to be a Gardener's Supply Exclusive as currently claimed. We need more companies marketing SIPs and hopefully they soon become widely available in retail stores rather than online. There needs to be a much broader retail presence for consumers to become more aware of SIPs and their many benefits for personal and family food production. Currently they are under the radar of mainstream America. These sub-irrigated planters (SIPs) are Tomato Success Kits from Gardener's Supply. You can see the bountiful success that a city dweller had this summer growing fresh tomatoes on a high-rise balcony. The balcony happens to be in Chicago and the photos are from Laura White’s blog, The White House. Have I bragged about my tomatoes yet? I’m actually quite impressed with myself – in addition to adding fresh tomato to just about every meal since mid-August, I have 8 dinner portions of spaghetti sauce and 12 quart size bags of crushed tomatoes in the freezer already, with the last batch due to be picked and prepared on Friday. We should acknowledge bloggers like Laura for doing what our horticultural and botanic institutions are currently not doing. There are hundreds of blog posts like this in my pending file. My objective is to post all of them. It will be an awesome database of SIP validation. It already is. Just click on these categories (right hand column) D.I.Y Sub-irrigation, EarthBox, EarthTainer, Garden Patch Grow Box, Sub-irrigated Buckets, Sub-irrigated Grow Box and Tomato Success Kit for starters. The positive evidence is overwhelming and yet our botanic gardens are nowhere to be seen on the subject. There is no question that essentially all SIPs work if you know how to use them. It takes a minimal amount of education. Our botanic and horticultural institutions however are stuck in some prior century and preach only drain-hole and dirt gardening. It appears that change will only come when these institutions are forced to face reality. The blogosphere and then the mainstream media will in due time force them to do what they should be doing now. Were they private businesses they would not survive with this type of retrogressive behavior. 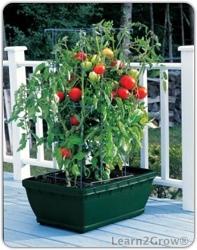 The Tomato Success Kit from Gardener's Supply is a sub-irrigated grow box very similar to the more well known EarthBox. This is a testimonial from the blog The Fisher Farm in New England. I just cannot believe how much these plants have grown in a month’s time. As you can see, each branch is supporting the most impressive amount of tomatoes! Not everyone has a yard, time or physical ability to access a community garden. A sub-irrigated (aka self-watering) grow box on wheels similar to this one could be on every sun-filled balcony across America. You can even make your own. All it takes is education that is currently in short supply from our gardening institutions. Please tell your friends. Denise has a rooftop garden in Greenwich Village, New York City and uses sub-irrigation (aka self-watering) planters from Gardener's Supply. Smart woman! It might help make the world a better, greener place to live if the "backward farmer" read some endorsements and reviews of the EarthBox and others like it. I sometimes wonder if extension agents have Internet connections. I have no connection to the EarthBox company whatsoever and my positive endorsement is generic to include many other sub-irrigated grow boxes such as the Tomato Success Kit, the Garden Patch Grow Box and home made versions. Jetson Green is a daily updated web magazine that's obsessed with green building, sustainable architecture, good design, clean technology in the built environment, and eco-friendly development. We like stunning buildings and market innovation. We also like educated, open-minded, demanding, and entrepreneurial readers and contributors. The magazine is published to inspire and engage all sorts of players in the green building revolution, whether a builder, designer, entrepreneur, innovator, developer, lawyer, architect, engineer, lender, contractor, owner, or environmentalist. These tomato plants are growing in a Tomato Success Kit from Gardeners Supply. The marigolds growing at the base are a neat way to improve the aesthetic qualities of the planter. We need more creative ideas like this. Nice job! You can see the growth progress of the plants from May 17 to June 27 here. The mariolds will use water that would ordinarily go to the tomatoes and increase the frequency of watering but that's a trade-off that many will find worthwhile. Need to adjust for available sunlight? Big storm coming? Having a patio party? Try moving your tomato plants around like this when they're growing in the flat earth or raised beds. See the full set on Flickr. 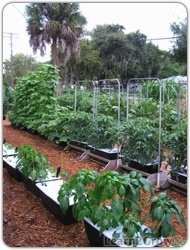 Learn2Grow.com published a significant endorsement of sub-irrigation (aka "self-watering") tomato planters. Slowly but surely, at an ever increasing rate I’m finding people who understand the benefits of vegetable box gardens. Perhaps one day soon the USDA Cooperative Extension Program, other horticultural organizations and botanic gardens here in the U.S. will upgrade their knowledge into the 21st century. They appear reluctant to acknowledge that everyone can grow superior vegetables without access to turned earth. 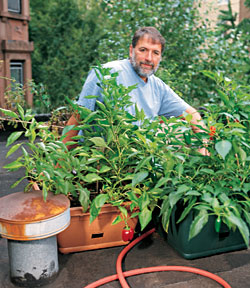 Peter Bergold grows in boxes on his roof right here in Brooklyn. His boxes are from GardnersSupply.com. Peter is an Associate Professor of Physiology and Pharmacology and a cook who found a way to grow vegetables he couldn’t find at retail. 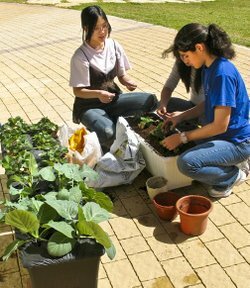 The young women on the right are students and members of the AIS ECO-X Club growing in Earthboxes in Israel. Although there's not much information about them, they obviously have one or more enlightened teachers.